Snow flurries forced early school closures Thursday and snarled traffic across the northern half of Texas from the Panhandle to Dallas. Much of the Dallas-Fort Worth metropolitan area got at least 1 inch of snow, along with freezing temperatures that ground traffic to a halt during the morning rush hour. School districts across the area ended classes early. 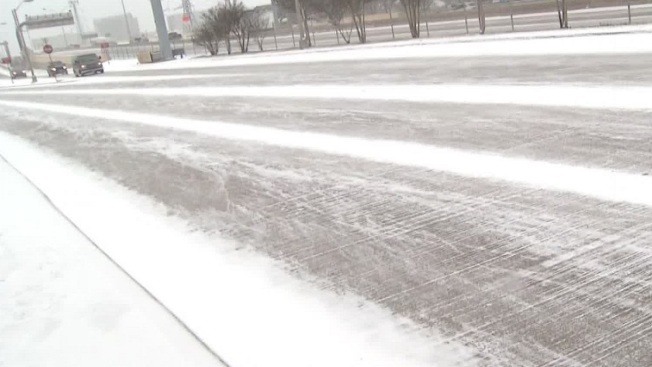 The city of Dallas activated a condition known as "Ice Force Level One," with 30 trucks sanding roadways and bridges. Dennis Ware, interim director of the city's department of street services, said trucks had started sanding the night before and would remain on watch through Thursday evening due to temperatures staying below freezing. "It's been coming down for hours," Ware said. "That's one level of hazardous conditions. When it melts and refreezes, that's when it really becomes slick." Snowfall amounts varied across West Texas from the Panhandle down to San Angelo and eastward to Abilene. National Weather Service meteorologists across the region said Potter County, east of Amarillo in the Panhandle, received the most -- about 5 inches of light, dry snow. Abilene recorded as much as 3 inches, Coahoma in Howard County got 2 inches and Lubbock got less than an inch. Roads were "a little rough" early Thursday from the light, dry snow that fell, said Matt Elder, the manager of Williams Travel Center on Interstate 40 near Amarillo. A couple of accidents occurred nearby Elder's truck stop but most truckers weren't slowed by about 3 inches of accumulation. "Truckers are a breed of their own," said Elder, who added that his parking lot was about the same as an average day. "They're blue-collar, hardworking guys and getting the freight where it needs to go." No weather-related deaths were immediately reported. Extreme cold is driving a dramatic increase in electricity demand, according to the agency that operates the state's biggest electric grid. The Electric Reliability Council of Texas warned of possible rotating blackouts in the Rio Grande Valley of South Texas. It also asked the entire state to reduce electric demand through noon Friday. ERCOT blamed extreme cold and natural gas shortages limiting some generation capacity. An ERCOT statement also said the Valley is further affected by a planned outage on a transmission line that's being upgraded. The National Weather Service has issued a winter weather advisory for Central Texas for Friday with sleet and freezing rain in the forecast. On Thursday the council had recommended avoiding the use of large appliances such as washing machines, clothes dryers and electric ovens between 6 a.m. and 9 a.m. and 4 p.m. and 8 p.m. It also asked residents to turn off lights and appliances not in use and keep thermostats set as low as is comfortable, preferably no higher than 68 degrees. The council said demand Thursday morning topped 57,000 megawatts and could overtake its record of 57,277 megawatts before the cold snap eases.